At the time of the writing of the “Young Painter”, the name of Ivan Firsov was almost unknown. It is so unknown that in order to sell this picture a certain trader skillfully wrote over the author’s signature the sufficiently famous name of Anton Losenko. Fortunately, it was precisely the fact that the brush belonged to allegedly Losenko that art critics doubt that the authorship is correct: this painter preferred the classicist style and mythical as well as heroic subjects. Therefore, in 1913, the Grabar initiative led to the fact that the fake signature was finally washed away, and the truth was revealed to the world: the first picture depicting the life of an ordinary Russian person was written by that little-known Firsov somewhere between 1765 and 1766. Ivan Ivanovich opens the doors of the artist’s studio in front of us, which looks about 15-16 years old. 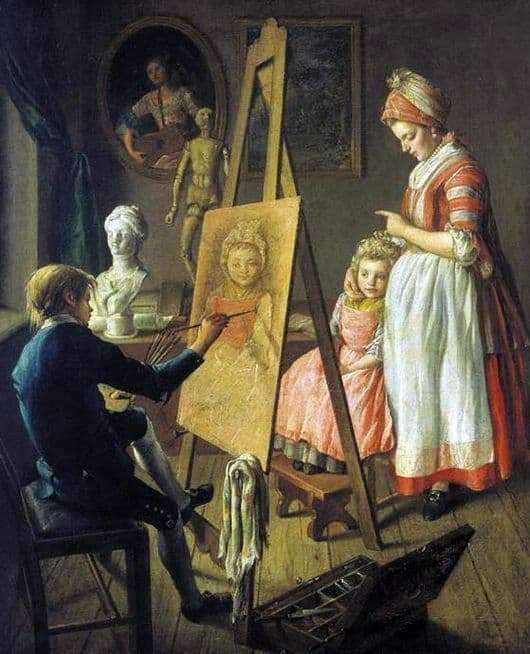 This boy in the blue suit, nevertheless, enthusiastically leads the canvas with a brush and very boldly draws the details of the portrait of a little pretty girl in a cute pink dress. She smiles slightly: the process seems to amuse her. Next to her stands, most likely, her mother, who hugs her daughter with one hand, threatening the other, apparently reminding the girl that it is not so easy to paint portraits, especially if the model is constantly turning back and forth. By the way, a woman seems to be pregnant: this is what her spacious dress and round belly says. Or is it all about her red and white clothes? A bit unclear. Next to the young artist is a wooden suitcase with its accessories, and on the easel hangs a white rag stained with paints of different colors. The background is also interesting. There are two pictures on the wall, a wall with a table on which there is a snow-white bust, a wooden model doll and some other things are lying on it. Also noteworthy is the dark green curtain, whose dark folds are drawn with care and love, like the whole picture.